Last updated 20 June 2018 . By Olivia Cheves. There is only one thing more singularly hellish than trying to get from Charing Cross to Leicester Square at speed, and that is trying to do it 25 degree heat. Battling through the influx of commuters, street performers and French school groups, it doesn’t matter if you leave your house smelling of roses, coming out of that fracas you’ll be giving off the scent of melted M&Ms, car exhaust and anxiety. Luckily for me there was a light at the end of the sweaty tunnel - the cool, lily-white dining room of the Leicester Square Kitchen. Proffering clean lines, white walls and pale-wood furniture, standing inside the restaurant could make even the most harried diner feel a wave of calm wash over them. Being a Monday, it’s a quiet night with just a couple of other customers eyeing up the menus. Part of the Edwardian Hotels’ remit, this sleek hotel eatery is one of three London locations, including the May Fair and Monmouth kitchens, serving up a mixed bag of multicultural small plates. Leicester Square’s particular repertoire stretches to contemporary Mexican and Peruvian cuisine, with a menu of tequila and mezcal cocktails to match. 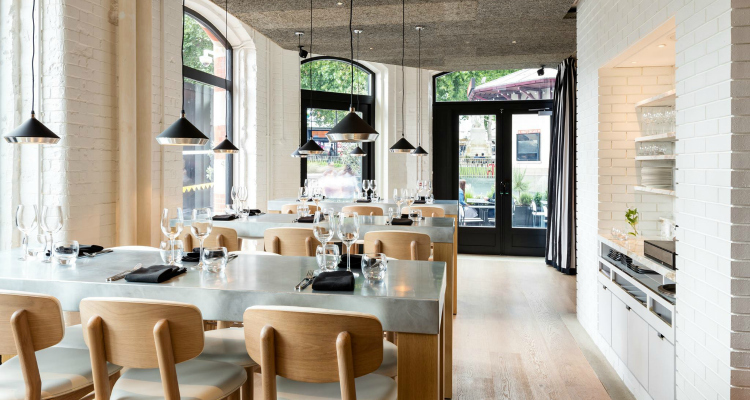 Bright and breezy interiors make Leicester Square Kitchen a sanctuary from the busy city. I can’t claim to know a huge amount about Peru, other than it is the native home of both the potato and Paddington Bear, but my interest is piqued the minute the sea bass ceviche (£11) arrives. A sizeable piece of soft, translucent fish basking in a sharp sauce and decorated with with avocado, corn and red onion, it’s as easy on the eye as it is on the taste buds. So too is the Hibiscus Margarita (£9) whose cold and frothy mix of mezcal, Chambord, lime, egg white and hibiscus and ginger tea syrup offers further respite from the heat outside. The dishes come as they’re ready and before long plates are wrestling for space at our little table. We make quick work of the dry-rubbed short rib with smoked chilli mayo (£5) - fun-size tortillas piled high with tender peppery beef. The crispy tiger prawns with cayenne pepper mayo (£10) - popcorn shrimp, by any other name - prove exceptionally snackable and it’s not hard to imagine finding peak satisfaction in these crunchy morsels after a few too many hibiscus margaritas. They work particularly well when dipped in the lemon rocoto dressing that comes with the seared scallop salad (£10). Light, but with a rich, almost umami flavour, it lets all that scallop-y sweetness shine brighter than ever; if I could, I’d dip my entire life in it. 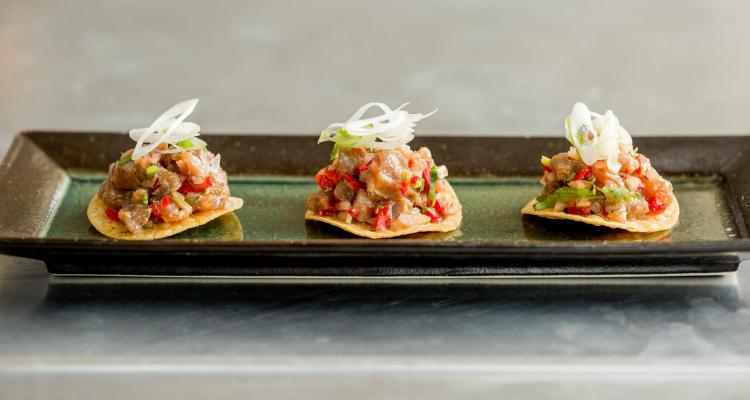 The small plates at Leicester Sqaure are as delicious as they are beautiful. Served in an artistically battered tin mug, The Square Punch (£9) fronts El Dorado 3-year-old rum, Velvet Falernum, lemon and grapefruit sherbet, green tea and lime with an aromatic teapot bitters mist. It sounds complicated, and tastes it too, with gentle notes of spice and citrus weaving their way through this long, cooling drink. It makes for an interesting accompaniment to dessert, as the devilish Esfera de Chocolate (£5) is enough to get anyone hot under the colour. Two warm chocolate-filled doughnuts are served with caramelised pistachio and dulce de leche ice cream, for a rich and decadent finale. The yang to the doughnut’s yin is the Turrón de Hielo (£6), a light and refreshing bowl of frozen yoghurt, sesame nougat and fresh berries wrapped up with a drizzle of raspberry and beer coulis. Full of summer berries and vibrant colours it’s the perfect palate cleanser after this menagerie of flavours. A cool drink of water on a hot summer’s day, the Leicester Square Kitchen offers a simple and elegant venue where fiery flavours can be brought to fore. A perfect escape from London’s steaming streets, you’ll almost forget that you’re eating by one of the city’s most popular tourist attractions as the food here should be an attraction all of its own.